Crowe in Maria’s Garden in Avon. Crowe arrived at Friendship APL from Mahoning County. He had been sitting at the pound for a month. We could not figure out why this 7 month-old Lab mix puppy would need our help. He had a sweet disposition and was very social. What could we do to help get this puppy out of a cage and into a home? We decided to do a photo shoot! 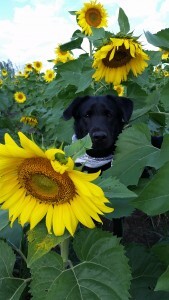 This picture taken of Crowe in Maria’s Garden in Avon was shared by thousands of people and viewed by tens of thousands. Thankfully, it ended up on the Facebook page of his new family. They saw the photo and brought their whole family down with them. The moment they saw him they knew he was a perfect fit for them. 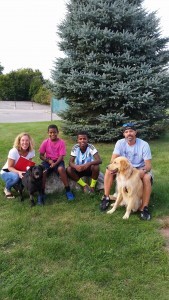 Crowe was adopted on September 18th, 2015 by his new family! But that is what makes Friendship special. We have the ability to get these dogs out there to the world. We take the time to make sure that everyone of our dogs and cats are viewed as individuals. If they are special to us, they will be special for those families that come and add a companion pet to their family! 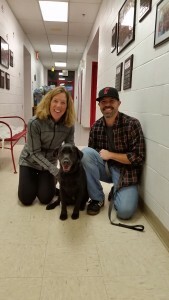 We have dogs that have found homes from Toronto to Florida, South Carolina to Portland. Crowe (now Crew) found a home right here in Lorain County. Crowe came back for a visit right around Christmas Day! These are the adoptions that we love! It’s not just the dogs and cats for which we work so hard to rescue; it is the families that take them home and make them a part of their life. Crew is one of thousands of stories that are created every year at Friendship APL. Come down for a visit and help write a new story for one of our dogs or cats.